How’d you sleep last night? Like a baby or as if your mattress was a bed of nails? Was the tossing and turning too much and did you wake up feeling exhausted? If you’re having trouble sleeping, you could be harming your health. You see, sleep is necessary and if you think pulling all-nighters or skimping out on sleep is OK, think it through a bit more. Sleep is essential for many health benefits such as resetting our bodies, organizing and processing memory and reducing inflammation. It helps keep us energized and focused, regulate weight and lower stress. With so many areas of our health affected by sleep, getting a good night’s rest shouldn’t be overlooked. When we don’t sleep we set ourselves up for poor health. There are many factors which may lead to sleep deprivation, such as stress, depression or other mental illness, irregular schedule and even diet. Determining the underlying cause of your lack of sleep can help you determine how to improve your sleep and get more of it. As you can see, there is much to lose with sleep deprivation, so getting the best possible sleep you can is ideal for good health. An easy way to improve sleep is through diet. In fact, there are foods that help promote sleep. If you’re wondering how on earth to get a good sleep, enjoy these 7 foods. 1. Fish: Fish that contains B vitamins, like halibut and salmon, can help you get a good sleep. B vitamins help the creation of melatonin – the hormone responsible for sleep. A healthy helping of fish can help sleep, just try to limit fish high in mercury like tuna. 2. Tart cherry juice: Another food that helps sleep is tart cherry juice. Similar to fish, tart cherry juice is rich in melatonin so it can assist in your ability to have a good sleep. 3. Whole grains: The Journal of Orthomolecular Medicine reports a deficiency in magnesium can lead to sleep problems. Luckily, whole grains are packed with magnesium so they are definitely a food that helps sleep. 4. Kale: This powerful green vegetable is great for overall health so it’s no wonder it is a solution for how you can get a good sleep. Kale is a great option to take in calcium if you are lactose intolerant because kale is high in calcium. Research suggests that being low in calcium may disrupt sleep, so enjoying kale may improve your quality of sleep. 5. Bananas: As a source of B vitamins and potassium, bananas are foods that help sleep. B vitamins are needed for the production of melatonin, so if you’re low in them you may find it more difficult to sleep at night. 6. Fortified cereals: Fortified cereals are a great way to get in vitamins and other nutrients if your diet is lacking. Although carbohydrates are good for promoting sleep, eating the right carbohydrates is best. That means staying away from the processed baked goods and white bread, and opting for whole grains and fortified cereals. 7. Herbal tea: Unlike coffee, which can be highly caffeinated and stimulating, herbal teas are a great choice to promote good sleep. Tea is a soothing, relaxing beverage, especially when you sip it slowly. With its comforting warmth and floral scents, it can be an ideal beverage right before bed and how to get good sleep when stressed. 1. Coffee: Although warm like tea, coffee contains caffeine. If you drink it too close to bedtime, it can increase your heart rate and keep you wide awake. 2. Meat: Steak and even chicken, although good for you, consumed before bed will keep you awake and restless. Because these foods are harder to digest, your body will use energy to break them down. More energy means less sleep. If you do decide to have these foods before sleep, add in a carbohydrate to slow down the digestion process. 3. Spicy foods: Spicy foods have their benefits like speeding up your metabolism, but an Australian study found that individuals who consumed spicy sauces had less of a chance of falling asleep. Furthermore, these individuals also experienced more heartburn which also kept them awake. 4. Soda: Cola and other sugary drinks are not ideal for good sleep. Not only do these beverages contain sugar, which can boost energy temporarily, they are also caffeinated. If you need a beverage before bed stick with water or tea as mentioned. 5. Dark chocolate: It’s true, dark chocolate holds many heart-boosting benefits but it can disrupt your sleep. Chocolate has caffeine, and depending on how much you consume, you could be taking in the same amount of caffeine as an espresso. If you want the benefits of dark chocolate, enjoy it earlier in the day and not before bed. 6. Alcohol: Alcohol can make us feel tired, but it doesn’t mean we’ll experience proper sleep. In fact, those who drink alcohol as a sleep aid will experience fewer rapid eye movement phases – REM – which is when the body is in its deepest sleep. You may be going to sleep quicker, but you’ll be waking up more throughout the night and wake up quite groggy. 7. Fast food: That late-night trip through the drive-thru won’t benefit your sleep. The fat content of fast-food creates acids in the stomach leading to heartburn. This acid can also damage the esophagus and stomach, allowing it to enter areas where it shouldn’t be. Fast-food is not recommended for sleep or health overall. If you’re looking to improve your sleep, diet can be the first place where you begin. Eating foods that help sleep is a great way to start sleeping better, while also receiving other health benefits through the foods’ nutrient content. Additionally, if you want to get good sleep when stressed, reducing that stress is your starting point. Whether it’s work-related or stresses of life, stress-reducing methods like meditation are great to improve your quality of sleep. Sleep deprivation is linked to so many health concerns. Doing what you can to improve it will, in turn, improve your health overall. If you continue to experience sleep problems, speak with a doctor – there could be a more serious underlying medical concern. 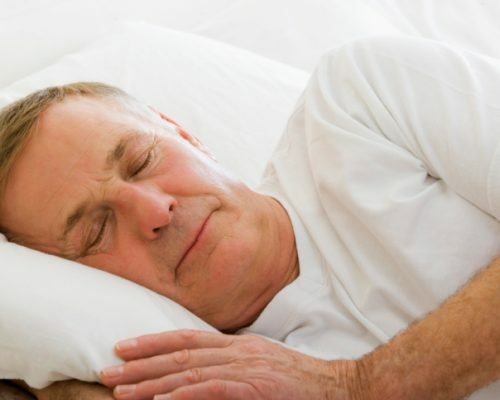 Sleep issues are so common with seniors. Some will fall asleep easily, but wake up after only a couple of hours, which is far from ideal. This lack of sleep can become so overwhelming you might find that you can’t participate in normal activities.